﻿ Issues Related to the ‘Aqida of Imam Ibn ‘Abdal-Barr (d.
That said, if Al Hafiz Ibn ‘Abd al-Barr’s statements apparently attribute place and direction to Allah, these same words can be understood otherwise, absolving him of the anthropomorphism of which he is accused. In addition, his statements in numerous other places are in line with those of Ahl al-Sunnah exalting Allah (exalted be He) from any resemblance of His Noble Essence with that of His creation. The hadith [of Allah’s descent] provides evidence that Allah is in (fi) the heaven, on (`ala) the Throne, above (fawq) seven heavens, as the Congregation (jama`a) said, and this is part of their proof against the Mu`tazila and the Jahmiyya‘s claim that Allah is in every place and not on the Throne…. Part of the right owed Allah’s Speech is that it be taken in it literal sense (`ala haqiqatihi), until the Community concurs that what is meant is the metaphorical meaning, when there is no way to follow what is revealed to us from our Lord except in that way…. However, upon closer analysis it is clear that Ibn ‘Abd Barr did not intend descent in a physical sense when taking into account other statements of his which are much clearer. To proceed, he [Ibn ‘Abd al-Barr] said, “Allah, azza wa jal, is in the heaven, on the Throne, above seven heavens” but he did not pin down what is meant by “in the heaven, on the Throne, above seven heavens”. Further Ibn ‘Abd al-Barr neither interpreted those terms figuratively, nor said anything like the impostor’s claim that what is meant by the Throne and the heaven is but the upward direction. Crucially Qadi Ibn Jahbal clarifies that the statement is not necessarily an affirmation of direction for Allah. Such statements and their like have already been discussed in the article: The Creed of Imam Bukhari and the Salaf Quoted in Khalq Af’al Al-Ibad. They are in refutation of the “the Mu`tazila and the Jahmiyya‘s claim that Allah is in every place“ as Ibn ‘Abd Al-Barr says himself. This is not the belief of the Ash’aris. Of course nobody can deny that Ibn ‘Abd al-Barr was criticized by numerous scholars but we should understand that none of the people of knowledge was protected from speech or criticism of another against him. Some of what refutes the charge of anthropomorphic literalism against Ibn ‘Abd Barr will follow through excerpts of his own words. His rejection of linking descent to Allah’s Essence is consistent with the opinion of all the scholars (al Jumhur) and differs with the opinion of the Hashwiyyah. This is an exaltation of Allah from the occurrence of accidents in His Essence by Ibn ‘Abd al Barr, an agreement with a major principle among the principles of Ahl al-Sunnah and a divergence with the principles of the Hashwiyyah. Here, Ibn ‘Abd Barr uses the terminology of mutakallimin as he mentions substance, accidents and body and then denies them for Allah, as he also denied motion and movement, and this is consistent with the opinion of the majority and clearly diverges from the position of the hashwiyyah. Another statement the Wahhabis like to quote is found on the Salafi Publications website. This is a statement Imam Ibn Abdal-Barr reported from Ibn Khuwayz Mindad who alleges that according to Imam Malik the Ash’aris are somehow innovators. Firstly, its not Ibn Khuzaimah – it is Abu `Abd Allah Muhammad ibn Ahmad ibn Khuwayz Mindaad al-Basri. 1. Abu `Abd Allah Muhammad ibn Ahmad ibn Khuwayz Mindaad al-Basri did narrate hadith but he did not become known as a Muhaddith, much less a Hafiz but was one of the Jurists and Usuliyyun of the Malikis. 2. Ibn Khuwayz Mindaad died in 390. He is NOT a companion of Imam Malik but came 200 years and seven biographical layers later. When he says “Maalik said…” he is not a reliable source unless he is confirmed independently. This, even if he produced his chain to Malik’s supposed statement; what then if he does not even have a chain! 4. `Iyad also exposes Ibn Khuwayz Mindaad as an extremist in his anti-kalam stance: “He alienated the Mutakallimin of Ahl al-Sunna and ruled that all of them were among the people of vain lusts (ahwa’) concerning whom Malik said his famous statement on [avoiding] their marriage, [rejecting] their witness and leadership, and alienating them.” Ibn Farhun (d. 799) cites all of the above in al-Deebaaj al-Mudhahhab (#491). 5. Imam Malik meant the Mu`tazilis and their sub-sects by consensus in the statement in question, as is made clear (among other sources) by Ibn `Abd al-Barr himself in his report from the same Ibn Khuwayz Mindaad in the previous page cf. 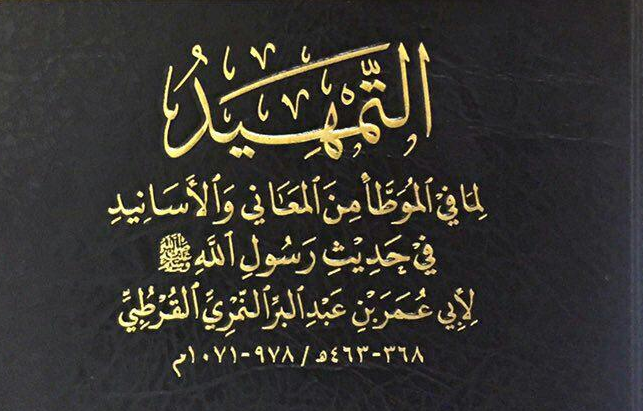 Jaami` Bayaan al-`Ilm wa Fadlih (1994 Saudi ed. 2:942-943 #1800). It is known that Imam Malik never retained any Mu`tazilis, Qadaris, or Khawaarij in his Muwatta’ as narrators, while the Two Shaykhs (al-Bukhari and Muslim) and their students such as Imam al-Tirmidhi did narrate from Qadaris and even Jahmis. See on this the relevant chapter in Imam al-Suyuti’s Tadrib al-Raawi. Allāh knows best, but by theological rhetoric, they only meant the theological rhetoric of the people of innovation. During their epoch, it was only the innovators that were known for theological rhetoric. As for Ahl al-Sunna, very infrequently did they engage in theological rhetoric until they were obliged to do so afterwards. 2. The opponent used the words of Ibn Khuwayz Mindād al-Mālikī against the Ash’arī school, yet the reality is that he was not considered reliable in his knowledge or citations. …Abūl Walīd al-Bājī spoke ill of him stating that he was not skilled in investigation, nor was he strong in jurisprudence. He used to claim that in the school of Mālik, it is not permissible to witness the funeral prayer of a practitioner of theological rhetoric, accept their testimony, marry them, or entrust them. Ibn ‘Abd al-Barr also criticized him as well. I did not hear any mention of him among the scholars of the Iraqis. He used to completely shun theological rhetoric and have aversion towards its people, so much so that this led to loathing of the practitioners of theological rhetoric among Ahl al-Sunna. He ruled that the people of theological rhetoric were people of desires, concerning whom, Mālik said what he said with regards to their testimonies and marriages. So this is the view of some of the leading Mālikī scholars and jurists, such as Ibn ‘Abd al-Barr, al-Bajī, and Qāḍi ‘Iyād, not to mention the view of one of the leaders in al-Jarh wal-Ta’dīl (criticism and lauding of Hadīth narrators), Hāfiẓ b. Hajar. Likewise, there is no doubt that most of the Mālikī jurists are Ash’arīs. Hence, his own position towards kalam is a moderate one in keeping with that of the majority of Sunni ‘Ulema. Whilst the aim of this article is not to sweep under the carpet any valid criticism the Imam received for certain statements of his that were considered problematic, it remains important to highlight that when taking his other clear statements into account it is obvious to all how far he was from the beliefs of the Wahhabi / pseudo-‘salafis’ of today who like to selectively quote him when it suits their twisted agenda. Tartîb Ul Madârik of Qâ d î ‘Iya d Ibn Musa Al Ya hs UBI. See Tabaqât Shâfi’iyyah Ush Al Kubra of Imam Taj Ud Din Ibn As Subki. This means that the Arabs sometimes use the same word in the same sentence for the needs of eloquence without the same term used having the same meaning. Here in the hadith cited, the word “malal – weariness / boredom” is used twice in the same sentence, but not in the same meaning: the first word “malal” is used in the literal sense for humans, and the second is used metaphorically (majaz) befitting the magnificence of Allah. Here we see the difference between the Wahhabis who attribute to Allah “weariness” and Imam Ibn ‘Abd al-Barr who exalts Allah of that, and so we see that ht has the same position as all the Sunnis and that Wahhabis are really deviant in their attributing to Allah attributes of such imperfection! Will they dare declare Imam Ibn ‘Abd Barr a mu’âtil as they do with other Ash’arites for doing ta’wil of “weariness” in this hadith? Please update all the links from Marifah.net to Marifah.info. This is now the new domain, as the previous one was lost and we couldn’t recover it yet. Please update all the links from Marifah.net to Marifah.info. This is now the new domain, as the previous one was lost and we couldn't recover it yet.